Product #2801 | SKU SAQ8 | 0.0 (no ratings yet) Thanks for your rating! 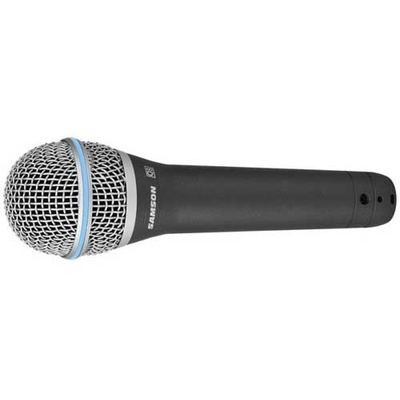 The Samson Q8 is a high quality handheld microphone designed for vocal and general instrument capturing in recording and sound reinforcement applications. The heart of the capsule features a neodymium element which results in exceptionally high gain with a low output noise floor. The linear frequency response results in accurate reproduction of vocals. High SPL response enables the Q8 to be placed near transient signal sources such as drums and guitar cabinets with minimal distortion and noise. The element is internally shock mounted which further reduces output noise. The heart of the capsule features a Neodymium element that provides exceptional output gain while minimizing output noise. The super-cardioid polar pattern provides attenuation at the off-axis (sides) of the microphone capsule. The result is minimal ambient noise caused by other instruments, monitors, etc. The capsule is internally shock mounted and further minimizes handling noise.